This lesson summarizes the science and techniques used to measure atmospheric wind. It presents an overview of the main sensor types for wind, including mechanical, electronic, and drifting-position sensors as well as sensors relying on impact pressure and sensors utilizing timing or Doppler shifts. The advantages and limitations of the sensor types and information about uncertainty and errors are reviewed with a focus on understanding which sensors might be best for particular applications. The lesson concludes with wind measurement applications including turbulence profiles, turbulence flux measurements, wind speed analysis, and variance spectra. 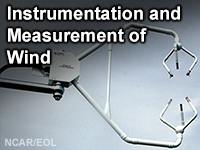 Explain the working principles of major instruments used to measure the wind. Describe the strengths and weaknesses of those instruments, including uncertainty, cost, and representativeness. Use measurement characteristics to match scientific requirements. Apply the knowledge gained to example exercises.